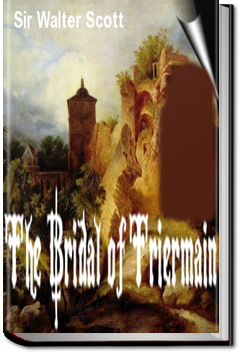 Scott’s The Bridal of Triermain is a rhymed, romantic, narrative poem which weaves together elements of popular English legend using dramatic themes. This beautiful poem celebrates the exploits of a knight errant – Sir Roland De Vaux – as he seeks to rescue (and hopefully espouse) a beautiful maiden, Gyneth. Gyneth is the illegitimate daughter of King Arthur: doomed by Merlin 500 years previously to an enchanted sleep inside a magic castle. The enchantment can only be broken by a rescuer both brave and noble enough to overcome the temptations used successively to distract and overcome him, namely: fear, wealth, pleasure and pride.